Apparently, there's a new agent to be captured and harnessed in the fight against evil. A USA Today article describes the heretofore untapped resource of the half-inch parasitic wasp -- from detecting bombs and explosives to crop fungus and cancer. The "ability to capture nature and its marvels is ... revolutionary." 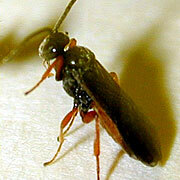 Moreover, "The sensitivity of animals (and insects) to chemicals in general is probably beyond what we can comprehend. We don't really know what the limits are." But do we really want to explore those limits? The whole man-vs-nature battle is rather unique to the western scientific world view. Our desire to overcome and control nature is exactly what is bringing this planet to the brink of destruction. Hopefully we'll figure out how to cultivate a clean and healthy planet before we completely destroy this one. on the one hand, i see the positives of using wasps as a natural detector of things...probably less resources, waste, pollution, etc. but on the other hand, (not to be a doomsayer) is it justifiable of humans to attempt to right our wrongs (violence, sick crops, carciogenics, etc) through technological progress (i.e. the wasp)? The sad thing is that we can not turn back. We truely are "to far gone." But if we settle for that, then what's the point in having a cause, in even having an idea. So these "wasps" are just another way to halt any healthy way to figure things out. Hopefully "we" will someday stick our foot in the door and it will stay open.